I have been a graduate student researcher with the newly-established ALiGN Media Lab since 2015. On September 18, 2017, the ALiGN Media Lab officially launched at Carleton University! 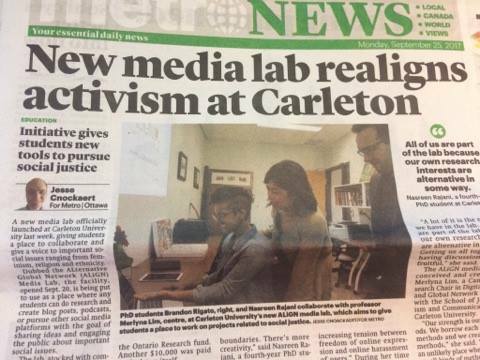 The ALiGN (Alternative Global Network) media lab is a research and public engagement lab housed in the School of Journalism and Communication at Carleton University. Our research focus is at the intersection of digital media, contestation of power, and collective resistance. We received some press coverage (thanks, Metro Ottawa!) about the launch. See here. If you missed the launch, you can also see the research presentation videos on our YouTube channel. I will be regularly blogging from the ALiGN website on topics mostly focusing on gender, tech, media and activism so make sure to check it out and stay up to date with us via social media: Facebook (ALiGN Media Lab), Twitter (@ALiGNmedialab).